There was little in the way of reading material to bridge the gap between the broadcast-level technical and the common consumer. Most of the generic publications were too simplistic with not enough meat. As the DVDs’ popularity developed beyond everyone’s wildest dreams, it became painfully obvious that there was a serious lack of credible printed matter to support the medium. And with HDTV in the wings, even less to draw from. Or so I thought, until I came upon Widescreen Review at a newsstand while on one of those proverbial business trips. I couldn't believe my eyes! Here's the kind of magazine I was looking for. But then, thinking that this was just a one-off issue, which just happened to contain an abundance of knowledge in an occasional issue, I decided to temper my enthusiasm and become a newsstand reader to see if the articles and features held up consistently. 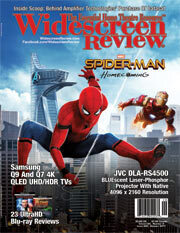 Well, that was all many issues ago and I'm now a dyed-in-the-wool reader of Widescreen Review. To their credit, the magazine has and continues to improve upon their expertise in the field. It's truly a one-stop resource when it comes to the latest in the ever-evolving world of audio/video integration for the consumer. Pixel on!